What plants to grow in your garden for hedgehogs – help hedgehogs thrive in your garden with this guide to plants that are great for our spiky friends. Contrary to popular belief, hedgehogs don’t mainly eat slugs. Their favourite foods are beetles and caterpillars. Growing plants to attract insects is therefore one of the best things you can do to help hedgehogs. Plus, you’ll help other wildlife too! As well as providing food and shelter for insects, plants also provide shelter for hedgehogs to forage and nest underneath. The more ground cover the better! Hedgehogs will often nest under large leafy plants. Don’t be too tidy – when plants die back in the Winter, keep the remains on the ground to provide hidey holes for insects. Don’t forget fences and walls – cover them with climbing plants and ivy. A garden that is great for wildlife needs to provide food all year round so plan your garden to have a range of plants that flower throughout the seasons. I love Forget me nots and lots of bulbs for Spring, Geraniums, Scabious and Wallflowers for Summer and then lots of late flowering Sedums, Hebes and Anemomes into the Winter. Any native plants are good but here are a few plant ideas to get you started. I love Geraniums because they offer great ground cover for hedgehogs. Buy a large pot and then divide it before planting. They will quickly establish. I do this with all perennials that flourish in my garden – I simply divide them in Spring to create more. It’s cheap and you know they will thrive. TIP: Many garden centres now offer native wildflowers as plug plants or you can grow them from seed. Hedges provide a great habitat for a wealth of wildlife including nesting sites and berries for birds. They also provide free access for hedgehogs between gardens, unlike walls and fences. Native species are best and ones with large deciduous leaves are great for hedgehogs collecting leaves for their nests. Don’t use any pesticides or herbicides on your lawn. I have learned to love the daisies, dandelions and clover that grow amongst the grass. It’s much better for all wildlife, including the insects. Good luck with your planting and please share your pictures! Please read my blog for more tips for hedgehog friendly gardening and what to feed hedgehogs in your garden. You can see a video of my wildlife garden here. I run a hedgehog rescue in York and I am also a keen gardener. All the photos are from my own wildlife garden. My work is entirely self-funded. You can read more about my work here and how to support it. 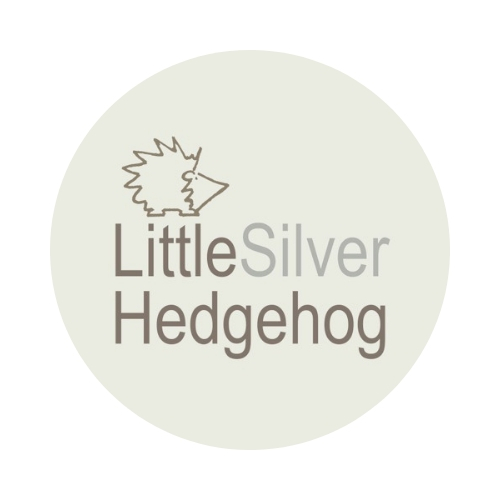 I also make silver jewellery inspired by nature and wildlife. You can visit my online shop here. I love your garden – it is attractive to the human eye as well as being hedgehog and wildlife friendly. Every garden should have at least one wild corner for all to enjoy!